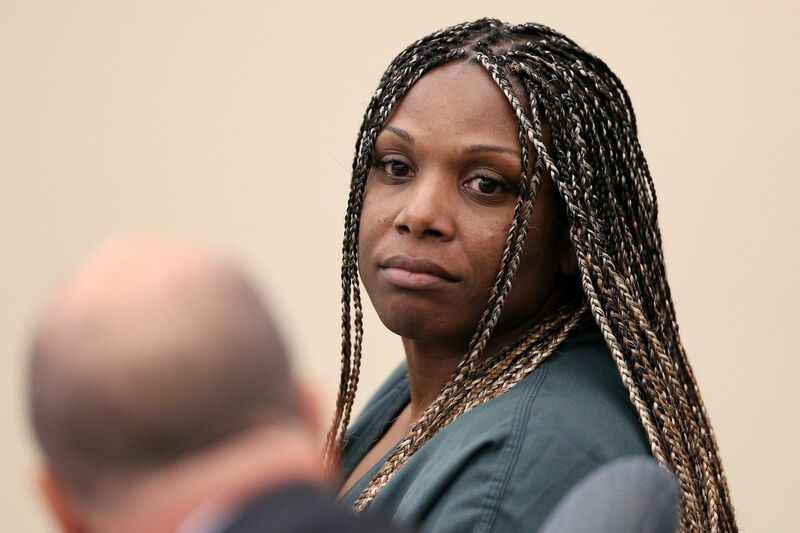 Chanel Barnes of Philadelphia looks backward during her Gloucester County Superior Court detention hearing in Woodbury, N.J., on Thursday, June 14, 2018. Barnes is accused of shoplifting from a Marshalls store in Deptford on Saturday, an incident that ended with a police officer fatally shooting LaShanda Anderson as the two allegedly attempted to flee in a car. A Philadelphia woman arrested for shoplifting at a Deptford strip mall after a confrontation with police that left an alleged accomplice dead was ordered released from jail Friday by a judge who described her character as "abysmal," but said she posed no flight risk. Chanel Barnes, 27, was ordered not to visit any Marshalls stores while she awaits trial. She must also report weekly to court officials. Even as he freed her from behind bars, Superior Court Judge Robert Becker denounced Barnes as a "frequent flyer" because of her extensive criminal record and previous shoplifting arrests. "Her history and character are abysmal," he said. Wearing a dark green prison outfit, Barnes was led into the courtroom with her hands cuffed in front of her. She politely answered the judge's questions and smiled at a friend in the back of the courtroom. Dianna Rolando, an assistant Gloucester County Prosecutor, pointed to Barnes' criminal history in New Jersey and Pennsylvania and contended that she should remain jail. Barnes has been arrested seven times for shoplifting in incidents that typically resulted in a probationary sentence. Her records include two convictions for fleeing police. Early last year, she was charged with shoplifting and giving false identification to police. She was jailed for at least six months. At the time of her arrest, Barnes was on probation, the prosecutor said. Defense attorney Julius Hughes, right, talks with assistant prosecutor Dianna Reed-Rolando, center, in Judge Robert Becker's courtroom before a Gloucester County Superior Court detention hearing in Woodbury, N.J., on Thursday, June 14, 2018. Barnes is accused of shoplifting from a Marshalls store in Deptford on Saturday, an incident that ended with a police officer fatally shooting LaShanda Anderson as the two allegedly attempted to flee in a car. "She still continues to commit crimes," Rolando said. Public defender Julius Hughes countered that the charges Barnes faced were third-degree offenses that did not merit detention. "This defendant has absolutely no violence in her history," he said. "She's only charged with shoplifting." Barnes was a passenger in a vehicle driven by LaShanda Anderson, 36, of Philadelphia, who was shot twice and killed after she allegedly tried to run over two police officers in a parking lot of Deptford Crossing. She had been trying to flee and avoid arrest on a shoplifting charge. A second accomplice, Raoul Gadson, 43, also of Philadelphia, fled the scene Saturday. He was captured in Philadelphia on Wednesday by the fugitive unit of the Gloucester County Prosecutor's Office. All three had extensive criminal records and prior arrests and convictions for a pattern of shoplifting. Authorities said they tried to steal $3,443 in merchandise stuffed into a suitcase from a Marshalls store in the strip mall. The NAACP has called for the state Attorney General's Office to take over the investigation. The civil rights group said it plans to conduct its own probe, too. A viewing for Anderson, the mother of three, will be held Sunday from 1 to 2 p.m., followed by services at Khadijah Alderman Funeral Service, 1924 W. Hunting Park Ave., Philadelphia. Interment will be at Friends Southwest Burial Grounds, 236 Powell Lane, Upper Darby. "Our family would like to thank everyone for all of the prayers, condolences, kind words and support during our time of bereavement," her mother, Gwen Rutledge posted on Facebook. "She was truly loved by many."